Though Shakespeare finished writing Othello around 1603, the play still brings to life dramatic themes of striking relevance. Jealousy, racism, feelings of isolation—all topics modern audiences can relate to. But would Othello interest a room full of high schoolers first thing in the morning? 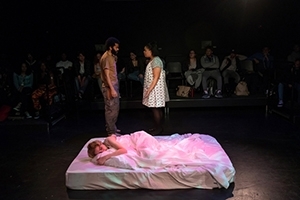 That was the question as the cast and crew of American University's sold-out production took the Katzen Arts Center stage at 9:30 a.m. on March 1. "This was probably our toughest audience," said director Caleen Sinnette Jennings, AU professor of theatre in the College of Arts and Sciences. "Children and high schoolers are basically like, 'If you don't grab my interest right away, I'll just tune out.'" Whatever the challenges of holding the attention of the Wilson High School crowd, Jennings felt Othello, in particular, would be valuable for them to see in person. "The focus of this play is the black male. I know Wilson has a strong population of students of color, so I wanted the students to see the play in this context," Jennings said, referring to this production's mix of wardrobe and staging elements both modern and traditional. "Many times, they're introduced to Shakespeare in the Elizabethan context," she said. "I'm trying to set it in a culture and in a semi-contemporary time to see what resonates." "Semi-contemporary," meaning Shakespeare and the present world mixed together. Costumes featured both modern military garb and tights. Desdemona's old-fashioned wedding gown was accessorized with shoes a woman might wear today. The walls surrounding the stage were plastered with posters featuring black men who are prominent in society or important on a personal level to members of the cast and crew, an assignment they completed during the winter break. "I tried to bridge the gap," Jennings said. "A little bit of Shakespeare's period, but the audience should feel these are people they know." In addition to the costuming and staging, Jennings noted the subject matter of Othello might be especially meaningful to teenagers. "This age group really understands inner turmoil—it's figuring out the relationship with their individual selves, and society, and family," she said. "We're still wrestling with those problems, and hopefully they don't feel so alone and so burdened with what's going on now." As the final scene reached its violent climax, the intensity onstage was reflected in the audience's faces. The intimate black box theater was silent as students leaned forward, eyes wide, waiting to see if Othello really would kill Desdemona. Thanks to how close the seats are to the Studio Theatre stage, Andrew Watring, who played Othello, was able to sense the audience's engagement. "I absolutely loved it. I think high schoolers are a harsh audience because you want to make them excited," said Watring, a junior theatre major. "Us trying to make it accessible for them, I think, really pushed our performance." Nadia Tewolde, a junior at Wilson, said they had read versions of Othello translated into modern English and "straight Shakespeare." Seeing it in person, however, was different. "It was cool actually hearing it, and how they maneuvered [onstage]," Tewolde said. "You get surrounded by the show." Classmate Chloe Turner, also a junior, chimed in: "When you read something, you have a set image in your mind of what it looks like versus when you see it in person. It conflicts with what you had in your mind," she explained. "I thought, 'Oh, I thought it was going to look this way instead, wow.'" After the show, the cast and crew spoke with the Wilson students, asking their thoughts and answering questions about some of the finer plot points. Once the students headed back to school, the actors enthusiastically talked about the show. Watring described an interaction with a student that touched him: "He said, 'Hey, man. You were really tough,'" Watring recalled. "I expressed a range of emotions—I was sobbing onstage, I was vulnerable—and the fact that I was still tough?" "They didn't laugh when you wept, that was big to me," Jennings said of Watring. "I really wanted to see if they could see that side of him and understand his strength and his vulnerability, and that was very moving to me."